August 26, 2013 August 26, 2013 elskenewman12 Comments on The first of many…. Yesterday Elisabeth fell over and grazed her knee properly for the first time, blood and everything, well a little bit. Considering she is two and a half we realise how lucky we are to have been injury/blood free for such a long time. But that wasn’t the main event this weekend. The biggest thing by far was picking up Elisabeth’s first pair of glasses. A couple of weeks ago Elisabeth had an eye test in hospital and it became clear that one of her eyes was stronger than the other and the weaker one wasn’t doing any of the work. Luckily we caught it really early and there would be no need for an eye patch, but she would need glasses to try and rectify the problem. So a week ago we all went into town to choose her some glasses. Elisabeth was quite excited about getting glasses (it helps that I wear glasses as well) and she did really good. She was really well behaved and helped us choose a super cute little pair that fit her little head. She even sat still when the optician did some measurements. Very good girl. Last Saturday it was time to pick them up. Again she was very well behaved and waited (almost) patiently as the lady adjusted her glasses so they would stay put on her tiny little nose. She wore them out of the shop and on the bus home. The rest of the day she spent a lot of time putting them on, taking them off, cleaning them and putting them back in the case. We thought it was going to be tricky to get her to wear them, but not at all. On Sunday she wore them for slightly longer periods and today she wore them almost all day. Doesn’t she look super cute? Even though I think she looks adorable, I’m glad that there is a chance that this is a temporary thing and her eyes could turn out just fine. As opposed to the grazed knee which, no doubt, is the first of many. I hope the glasses help correct the problem. 2.5 and no blood – WOW! I think you once mentioned that you were awkward as a child. Apparently, she is much more graceful. That’s good. I am sure she will take many positives from you as well. She does look adorable! 🙂 Mr. T has worn glasses for years and my favorites are always when he goes for “statement” glasses – ones that really stand out! This year he picked some like Elisabeth is wearing, except, guy version! 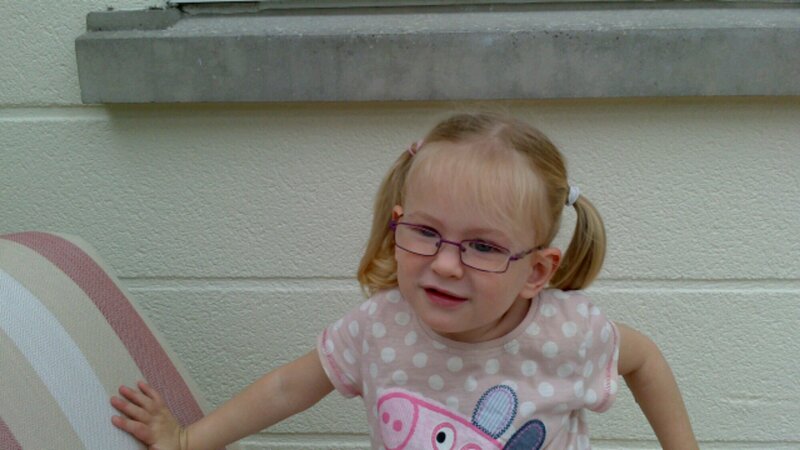 I love kids in glasses and I hope this helps correct the issue with her! PS, by the time T was 2-1/2 we’d already had several ER trips under our belt! So, a scraped knee… good time to count blessings! We know we have been very lucky so far on the injury front, although she just woke up screaming because her knee hurts so much, poor little monkey. She is cute as can be!